B. Thomas (Arlington, Texas, United States) on 18 June 2017 in People & Portrait. 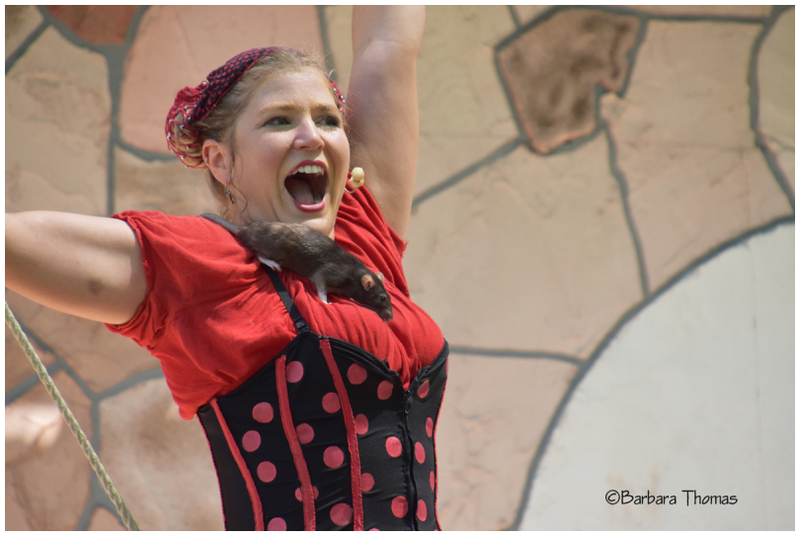 Cirque Du Sewer - The acrobat with afro-rats…and a confused cat. Melissa Arleth has been performing on stages since her community theatre debut at the age of 11. In 2009 she traveled to the San Francisco Circus Center, where she enrolled in the Clown Conservatory, endured mild torture at the hands of Chinese acrobats, and learned slack rope walking. In 2015, the first feline member, Pad Kee Meow, was added to the show and quickly became more beloved by the audience than Melissa and the rats combined. Her animals are rescued from a bad life - lab rats and a stray cat. They seemed very happy and well cared for, so I do think they would choose life with her. Well I hope the cat is not around. Another excellent image in your series. brilliant image! Lovely series...ye the rats seem to love her !!! Synergy for sure. A lovely shot of the performer. It looks like they are doing well together.